The reliefs of Colonna Traiana portray in many scenes Roman soldiers in the act of constructing a road through the forests of Dacia. The ancient Romans may not have added too much to the design of temples, but their engineering skills marked a significant step forward in the control of the environment and in making everyday's life more comfortable: even in the most far-away province of the Empire they built roads, bridges, aqueducts, canals, harbours, baths, circuses. Certainly travelling on a Roman road was not very comfortable: the large flat stones of basalt did not provide the continuity and smoothness of today's asphalts, but they are still where they were placed 2000 years ago: this because they were laid upon a multi-layer structure having a depth of 4 ft. which ensured their stability. Stratum is the Latin word for layer and the Romans called their multi-layer roads via strata from which the words strada (Italian), street (English), strasse (German), straat (Dutch) have come. c) roads named after a particular use they were known for: Salaria, Trionfale. By hovering over the circles you can read the names of the roads and by clicking on them you can move to a short summary in this same page. 1) Via Cassia: it branches off Via Flaminia at Ponte Milvio and leads to northern Italy through Viterbo, Siena and Florence; locations near Rome along Via Cassia shown in this website: S. Maria di Galeria, Isola Farnese and Formello. 2) Via Flaminia: it starts at Porta del Popolo and it leads northwards to Rimini, a town on the Adriatic Sea; locations near Rome along Via Flaminia shown in this website: Prima Porta and Malborghetto. 3) Via Salaria: it starts at Porta Salaria and it leads eastwards to S. Benedetto del Tronto again on the Adriatic Sea through Rieti and Ascoli; the road was used for the salt trade and it is named after it; locations near Rome along Via Salaria shown in this website: Ponte Salario. 4) Via Nomentana: it starts at Porta Pia and it leads to the small town of Nomentum, today Mentana; locations near Rome along Via Nomentana shown in this website: S. Agnese fuori le Mura and Ponte Nomentano. 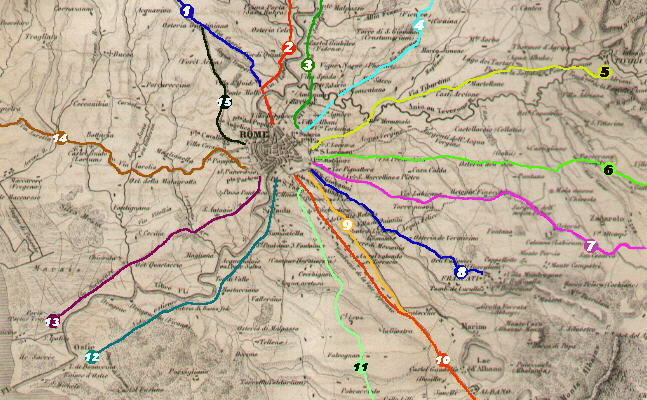 5) Via Tiburtina: it starts at Porta Tiburtina and it leads to Tivoli, the ancient Tibur; locations near Rome along Via Tiburtina shown in this website: S. Lorenzo fuori le Mura and Ponte Mammolo. 6) Via Prenestina: it starts at Porta Maggiore and it leads to Palestrina, the ancient Preneste; locations near Rome along Via Prenestina shown in this website: Tor de' Schiavi and Ponte di Nona. 7) Via Casilina: it starts at Porta Maggiore and it leads to Casinum, today Cassino; locations near Rome along Via Casilina shown in this website: SS. Pietro e Marcellino. 8) Via Tuscolana: it starts near Porta S. Giovanni and it leads to Tusculum, an ancient town, now abandoned near Frascati; locations near Rome along Via Tuscolana shown in this website: Porta Furba. 9) Via Appia (Nuova): it starts at Porta S. Giovanni and by following in part the old Via Latina reaches Via Appia before Albano; locations near Rome along Via Appia Nuova shown in this website: Tombe della Via Latina. 10) Via Appia: it starts at Porta S. Sebastiano and it leads to Brindisi (and across the sea to Greece) via Terracina, Capua and Benevento: for its importance it was called Regina Viarum (Queen of the roads); locations near Rome along Via Appia shown in this website: Basilica di S. Sebastiano and Tomba di Cecilia Metella and many other monuments. 11) Via Ardeatina: it branches off Via Appia near Basilica di S. Sebastiano and it leads to Ardea, a small town near the Tyrrhenian Sea; locations near Rome along Via Ardeatina shown in this website: SS. Nunziata and Santuario della Madonna del Divino Amore. 12) Via Ostiense: it starts at Porta S. Paolo and it leads to Ostia; locations near Rome along Via Ostiense shown in this website: S. Paolo fuori le Mura. 13) Via Portuense: it starts at Porta Portese and it leads to the lost harbour of Porto; locations near Rome along Via Portuense shown in this website: S. Passera. 14) Via Aurelia: it starts at Porta S. Pancrazio and it leads to France through Civitavecchia, Pisa and Genoa; locations near Rome along Via Aurelia: Villa Corsini, Villa Pamphilj and Palidoro. 15) Via Trionfale: its name derives by the fact that the consuls or the emperors returning to Rome after a victory preferred to branch off Via Cassia and enter Rome through Ponte Trionfale; locations near Rome along Via Trionfale: S. Francesco d'Assisi a Monte Mario.